Meet the increasing need for effective brain tumor management with the highly anticipated revision of Brain Tumors by Drs. Andrew H. Kaye and Edward R. Laws. Over the past decade, enormous advances have been made in both the diagnosis and the surgical and radiotherapeutic management of brain tumors. 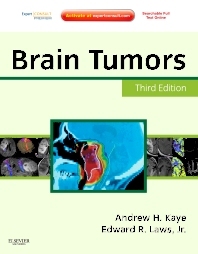 This new edition guides you through the latest developments in the field, including hot topics like malignant gliomas, functional brain mapping, neurogenetics and the molecular biology of brain tumors, and biologic and gene therapy. You’ll also have easy access to the complete contents online, with links to PubMed and a downloadable image library, at www.expertconsult.com. Benefit from the knowledge and experience of Drs. Andrew H. Kaye and Edward R. Laws, globally recognized experts in the field of neurosurgery, as well as many other world authorities. Edward R. Laws is currently the Director of the Pituitary/Neuroendocrine Center at Brigham and Women’s Hospital in Boston and Professor of Surgery at Harvard Medical School. He was formerly the President of the American College of Surgeons and has served as President of the World Federation of Neurosurgical Societies, President of the Congress of Neurological Surgeons, Editor of Neurosurgery, Chairman of the Board of Trustees of the Foundation for International Education in Neurosurgery, Director of the American Board of Neurological Surgery, President of the American Association of Neurological Surgeons, and President of the Pituitary Society. Professor of Surgery, Harvard Medical School; Director, Pituitary and Neuroendocrine Center, Brigham Women's Hospital, Boston, Massachusetts, MA.